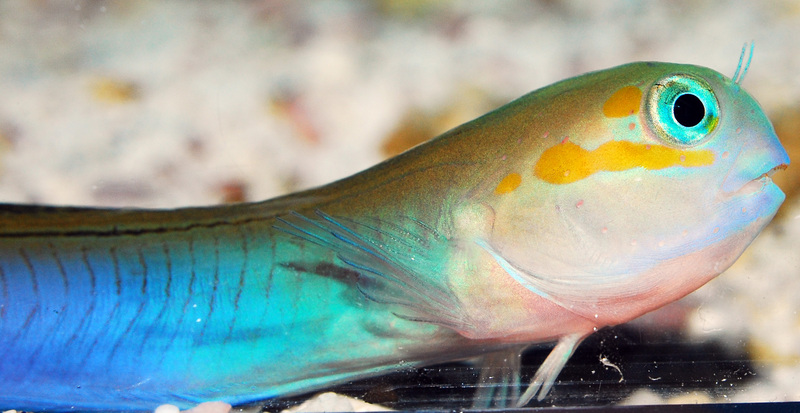 The Midas Blenny is one of the most popular blennies for reef aquariums because of its beautiful yellow coloration. Its mouth shape is evidence of its omnivorous diet, so provide meaty foods like frozen mysis and enriched brine shrimp along with algae and plenty of live rock for grazing. They’re mostly peaceful but may nip at other small, elongated fish. You can prevent these territory disputes by housing them in a larger aquarium. Midas blennies vary a lot in coloration from brown to yellow. You may occasionally see a “Blue Midas Blenny” for sale with a bright blue body. The more yellow or blue Midas blennies often command a higher price.